Obsessed with Scrapbooking: 24 New Cricut Lite Cartridges at Walmart with PREVIEW PROJECTS! 24 New Cricut Lite Cartridges at Walmart with PREVIEW PROJECTS! WOW! What a release! There is something for everyone in this set of cartridges! Need boy stuff? Party stuff? Men carts? Outdoorsy? Teen boy? All here! And there are loads of fonts with this release also! Here's the lowdown: 24 new Cricut Lite cartridges available at Walmart starting this week - price point is $39.99 OR less (people have found them for less...). These cartridges are bigger than mini cartridges, yet smaller than full size. There is one feature key but many of the shapes have four layers, making some nice die cuts! Melanie from Courtney Lane Designs and I have been working feverishly on projects for each new cartridge and each of use have 24 cards in which to inspire you. We are going to do it a little differently this time. We are going to release 4 at a time, so as not to overload you in one post. Don't forget to hop over to her site Courtney Lane Designs when you're done here to see her fabulous creations. Not only that, this is not all I have made (whachu talkin bout Willis?) so there will be lots more to see in the days to come! Melanie and I are working on our schedule of how to showcase these on all three blogs. There will be different projects besides cards so keep checking back! Now, how about a giveaway before we get started! The giveaway is the Give A Hoot cartridge! 1) Make sure you are signed up to get email/RSS feed or follow the blog! 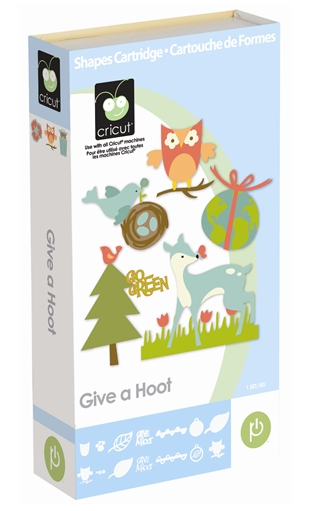 2) Leave a comment below for a chance to win telling me your favorite of the Cricut Lite cartridges! Drawing will be open until June 20, when winners will be announced! This cartridge has an entire set of tags on it with the main image motifs. They are layered and gorgeous. 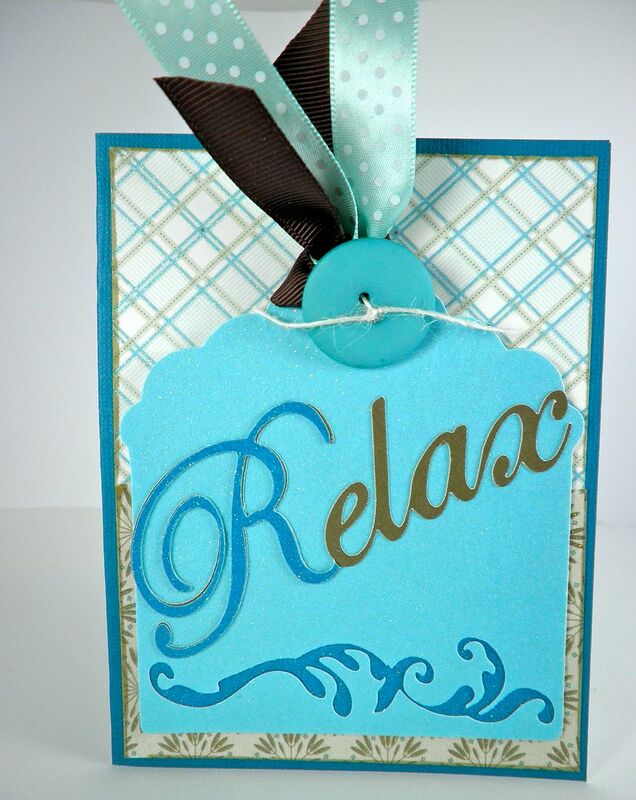 Here the cuts are the tag and the "relax" word art. Paper from DCWV and Core'dinations. 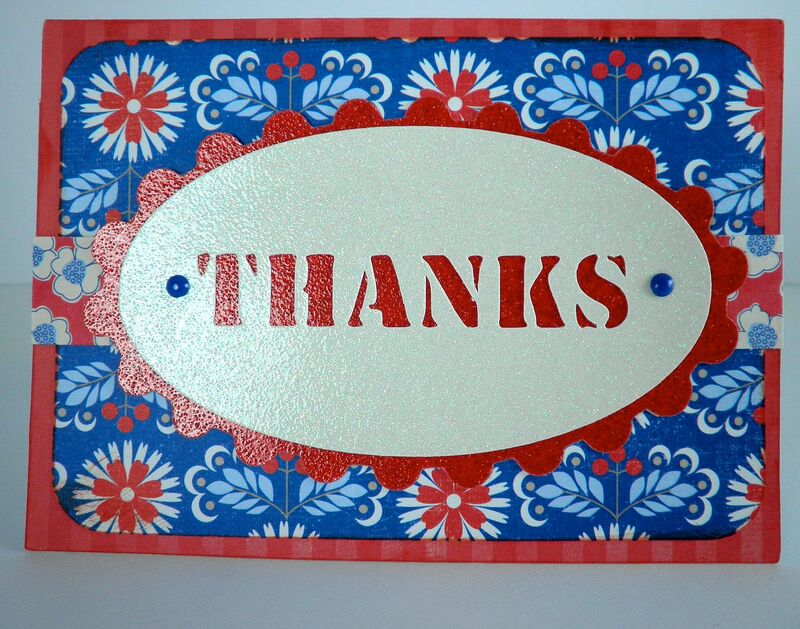 This thank you card front is on the cartridge (all cuts including the red background). I cut it at 4-1/4" and it came out to be 6" long. So I mounted this front on a card I cut to fit using my paper trimmer. Paper from DCWV. This is like the Monopoly game cartridge, hee hee! It comes with a font, upper and lower case and a shadow. This tie/vest combo and "dad" is from the cart. Paper by Stardream (gold cardstock), Core'dinations and DCWV. I really love this cartridge! I don't have Walk in My Garden and so I am loving all the flowers and cool word art on here. The tulips are from the cartridge. Paper by DCWV and Bo Bunny. Yay I'm first!! I really like the B is for boy since I have 2 little sons!! I really like the wildlife cart. I have been dying to have a cart with wolves, ect on it. Great job. Thanks for showing us them. I LOVE what you did with bloom! I think I like Millionaire best, it looks like some cuts suitable for guys cards/pages. i really like the cherry limeade cart :) great cards ! Splish splash looks cute and summery. love it. TFS great projects cant wait to see more. oh i love these but my walmart doesnt have any!!! NOOO! Can't wait to see what else you've made! I think my 2 must haves right now are Sugar n Spice, and B is for Boy. But Meow makes me curious too... I'm sure after all the enabling you girls do I'll think I need them all! Love it!! Can't wait to get some of these cartridges soon. Yeah!!! Those are soooooo cute! I bought B is for Boy yesterday and LOVE all the images on it! I don't even HAVE a boy, I have 2 girls! I can't wait to get more of these great cartridges!!!! I love each of your projects but am most surprised that you don't have Walk in my Garden!! LOL It's a great cartridge! Love the cards I think my favorite is B is for Boy, so many cute things on it. I got that one and Handy Man. Love the Bloom and I do have Walk in My Garden. But I'm a nut over flowers. You can never have enough. Thanks so much for the fantastic giveaways and the chance to win! Nice cards....can't wait to see what else you have made. Thanks. I am excited about the Handy Man cart as my husband is handy. I really REALLY would like to pick up B is for Boy -- but I've seen a lot with Lacey Labels... and that's on the list too!! I love these new cartridges. I really like the art work on the bar-be-que one. Great cards! These new carts are awesome! I can't wait for them to show up at my local WM - nothing yet :( I think my favorite is going to be Sugar & Spice! Thank you for sharing. Also thanks for the chance to win a cartridge. Nice work. I didn't know Bloom had tulips on it. Hmmm. Great blooms with the wrong kind of leaves for a tulip but I love the flower so much better than the one in WIMG. I can see myselt mixing the leaves and the flowers on that one. I love love love Billionaire. I fell in love with the mustache. Just like my hubbys. But the bonus is the fabulous script font. oh, my these all look SO fun! Love the splish/splash cartridge. Great graphics and font style. Thank you for this opportunity. These are great! I like the bloom cart. I look forward to seeing what you do with all the carts! I am excited for all of them! I think I am addicted! this is soo exciting. Love all of them. Cannot wait to get my hands on some of them. Just to pick one out of 24, not sure if I can do that. I think Lacey Labels is a must have right now. I LOVE dude and meow because i've been waiting for something like both of those for awhile! I would have to say my favorite so far (after a very quick scan through all of them) is the millonaire cartridge. My father-in-law has the exact same moustache as on the cart. It made me giggle- I would buy the cart just for that image!! Oh I'm going to want all of them by the time you all are done! It's a toss up between Cherry Limeade and Meow. I can't decide which I like better. Very cute cards. I think the bloom card and cartridge are my favorite so far. TFS! My favorite is Splish Splash. What a perfect father's day card from Billionaire! I don't have Walk In My Garden either, and Bloom caught my attention from the start! I love those tuplips! Cute projects! I think my favorite cart so far is Savory but I also like the images from Sugar and Spice and B is for Boy. I know you warned us about our wallets...watch OUT!!! Okay I love almost all of them but my FAVORITE is Cricut Lite Hoot ‘n’ Holler Cartridge. I love all of the boy carts but I LOVE owls!!! I like the handyman cartridge. Certainly could use that one here!! Thanks for the sneak peek. Your hard work has paid off, as all of these projects are GREAT! I too thought of Monopoly when I first seen the Billionaire cart! I like the Dude. I have 2 boys and a husband that love that kind of stuff. I love them all. Thanks for sharing. Great cards. I really like the Celebrate with Flourish and Lacy Labels. Love them all.Can't wait to use them. I think Lacy labels is the one I want first. These are really awesome!! I love your projects. The splish splash one is cute, but I don't know that I've really picked a favorite yet. well, after checking out about 10 of them, I realized I cannot pick one favorite! They are all great! Wonderful cards!! I am loving the cuts off of the Bloom cart the most....it may be a MUST HAVE cart for me....I ♥ flowers. How can I pick a favorite? There are so many cute ones! Thanks for the giveaway! Keep posting projects! I love them all, my credit card bill is not going to be pretty! Those are all very cute and now I can't wait to see more!! I love B is for Boy. I love those flowers...looks like Bloom may be on my wish list! I cannot pick a favorite? There are so many great ones. We just wanted to say "Thanks For All You Do". Goodluck to everyone. YAY! SO CUTE! I can't wait to see the Lacy Labels Cart! This is so intresting!! Thanks for sharing it with us!! This is so exciting, even with the early peek, to see the cuts is worth the wait. Can't wait till later today to see more. My favorite cart is Lacy Labels, am looking forward to see what you gals make. I am likeing the men and boys carts. DUde and handyman! Can't wait to get my hands on them! Until I saw your cards I thought I would be able to by pass these cartridges but now I want several of them..can't wait to see the rest of your designs...or my pocketbook might like it if I did miss the rest...Thanks for your post, we really do love it. ooohh so exciting... love the new stuff .. cant wait to see more! I really like the "Hoot 'n' Holler" cart, but they're all really cute. That card from Billionaire is so great! I can't wait to see things done with the Labels cart. I want that one so bad. In thefour years Cricut has been around I"ve never seen the excitement that is been surrounding these Lite carts! Your projects are WONDERFUL! I look forward to seeing more! I think the bloom is my favorite!!! Totally cute! Splish Splash! With Cherry limeade a close second! Tough choice to make this week!! Wonderful cards thanks for sharing them. I think splish splash is going to be a must have cartridge for me as I live in Florida. How can you pick a favorite, there are so many! Can I pick 3? I like the B for Boy, Hoot 'n' Holler and Sugar and Spice. Can't wait to get them! I think that I am going to have to get a third job now :( My favorite so far is the B is for Boy Cartridge. I am actually liking B is for Boy a lot more than I thought I would. Its not easy to pick just one. My favorite now is Bloom, might change later. I think Bloom has to be my favorite. I love your card. I just signed up for e-mail notifications. This is my first visit. I love scrapbooking and card making, too. Thanks for sharing all your cute cards. I love the B is for boy. I can't wait to get it..I have two "1" year olds in the house and my daughter is expecting a boy in Oct! I def would put this one to good use! Thanks for sharing all the projects! Love your Bloom creation - the flowers are so cute! Thanks for sharing. Can't wait to see more. Thanks for sharing the new carts. If I have to choose it would be the bloom.....wait no the lacy labels....no bloom. I really can't choose just one! Now I just have to find a Wal-Mart, they haven't made their way into Manhattan yet. Chore Chart seems really great! wow, these look awesome! yay for Hello Thursday! but where oh where are the religious cuts???? UGH! a few of the Cricut Lites at Walmart, can't wait to see more!!!! 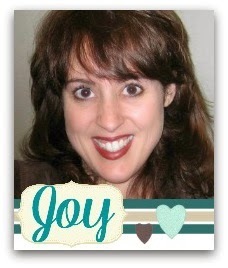 Thanks for the chance to win Joy! Keep going!! These are sooo great but I think my favorite is Celebrate with Flourish Cartridge Thanks for the chance to win!! Cute projects! I think my favorite new cartridge is Sugar and Spice. From these four carts, my fave is the bloom one. The tulips look really pretty. I love so many of them...but, the first one I have to have is Hoot 'n Holler! My favorite of all of them is Handy Man, followed very closely by Carousel. I like your Bloom Card best out of these 4 and will have to take a closer look at that cart! I am going to be so broke this time around. My favorite is the Handy Man! i'm on my way to the cricut website!! very exciting! Can't wait to see the rest! I love the dad card! Great cartridge give away. Good luck everyone! I love some of new carts. Oh boy hope to get some! Love so many of these. My favorite so far is the Celebrate with Flourish. Looking forward to all your projects. Hi Joy, I love your tulip card...I don't have WIMG either...this new cart might make a good alternative. I also love your 'dad' card...very cool! My favorite of the new carts so far is 'B is for Boy' because I have 3 boys...but Carousel is a close second. TFS! Man! You have been busy, busy, busy! I love the Tulip card. Can't wait to see more. Wildlife, Handyman & Dude are my top 3 (for today anyways!!!!) Can`t wait to see them up here in Canada!! I love the Botanicals! Your samples are so nice. Wow! The cartridges look amazing. My favorite is B is for Boy. Nice to see an all boy cartridge. I have 2 girls too so a close second is Sugar and Spice. Boy, it is hard to pick a favorite Lite cartridge, but I think I would pick handyman. B is for Boy and Handyman are my favorites so far. Joy, that tulip card is adorable! My favorite cart is Meow but I'm going to have to have several... Thanks for the previews! These are awesome, and my favorite so far is "Celebrate with Flourish"
Wow, there are sooo many. My 11 year old daughter likes the cherry limeade and was begging me to buy it, lol. I like the cupcake wrappers but I think my favorite is Chore Chart. oh joy excellent stuff my friend! as usual the two of you changed my mind on one of them but my fave i think is savory - SO need that one!!! I am so excited about the new cartridges. Thanks for the giveaway. unfortunately NONE of the walmarts in my area received any of the new cartridges. I love B is for Boy! I really like the Cherry Limeade cartridge. Thanks again for such a wonderful giveaway. For now, I will have to go with B is for Boy. I have a son and this is perfect for him! Wow thanks for the change to win. I really love the sugar and spice and Life Simply! I am so excited!!! Love the new carts! Love the projects!! I am in so much trouble w/these new lites! So many I totally must have!! I love the Meow Cartridge! I really hope they come to one of the Walmarts near me soon, so far no luck and I just have to have the varsity lettering and meow! Cute cards! The boy cart might be one I have to get or the handy man one. Wow, they are all so cute:). I am so going to have to save up to buy these cute cartridges. Someone/some company should sale them as a 24 cartridge bundle pack, but for a reasonable price :) lol. Thanks for sharing. I like the Splish Splash alot, but I think the Botanicals is my favorite (for now anyway!). Wow! Great job so far! I have to habe the B is for Boy cart! Can't wait! Thanks for the inspiration!! AND of course another giveaway!! Very exciteD! I like Splish Splash the best out of these first four. Hard to decide, but I think Bloom looks interesting.....wish we had them here now...dang it! I like the Cricut Lite Slumber Party Cartridge. Thanks for your project ideas. I love the Cherry Limeade and Splish Splash!! They are all so cute! I want the billionaire cart. I think it would be a kick for my heritage layouts. Thanks for the chance to win. I think Cherry Limeade is my fav! Can't wait to see what you make next! Thanks for sharing! I must have Splish Splash! It is the cutest ever! I must has the turtle that is on there! Thanks for the chance! I want B is for Boy for all of the modern baby cuts! love the Block Party cartridge. I'm also tempted by the cupcake wrapper and the celebration one. I am looking forward to seeing more from these cartridges. I was able to get Handyman and am on the prowl for Hoot 'n Holler. Wow Joy - you and Melanie have been busy. These new carts are so adorable. I want them all. Hope our WM's are carrying them. We will soon find out - I'm out the door in about 30 min. Thanks for sharing. You two have really come up with cute takes on several of the carts all ready. Can't wait to see more. There are some great carts here.Like you said something for all of us!!!!!!!! For me it's CATS!!!!!!! CATS!!!!!CATS!!!!!!!!! Wow...so many choices, so little time and money! LOL I like your cute flower! I am loving that Splish Splash cart already. Between yours and Courtney Lane's designs, I am seeing unlimited uses! Sugar and Spice and Handy Man... for now. I love the projects. Wow you must have been really busy. I love the first 4...only 20more to go. I love these carts so far....the Billionaire one is perfect for Father's day! I have a few favs. but my top fav would have to be the wildlife one...I live on a hunting ranch and I have soo many ideas running thru my head right now lol...but love them all. As an avid cupcake baker, I am excited about the Cupcake Wrapper cartridge...it will definitely be the first I buy! Love all the cards. I follow your blog daily for new ideas, thanks. I really like the bloom one. Live Simply is my favorite! I also love Hoot and Holler and The Chore Chart. OMG--I am on overload. I think I like the Billionaire--but the Boys is nice--it is so hard to find "guy" stuff. those are really nice cuts. i like the dad card best. I really liked the vest card! Ooohhh, I want Dude and Handyman and Chore chart and....ect. Lol. Love what you have done and can't wait to see more! These are so cute! Great job!! I think my fave of the lites is the Limeade one, or whatever it's called! I really like the font on that one. Nice cards thanks for the previews. I really like B is for Boy! It's exactly what I had in mind when thinking of crafting ideas for my little one. Bloom really caught my eye today. I like several but the one I think I would get the most use from is the Lacy Labels. Can see lots of possibilities for this one. I love your cards. The colors and papers are great. I love the tulips. Thanks for sharing. Wow! That is beautiful cartridges. I love them all. And you did Joy an amazing cards with them. 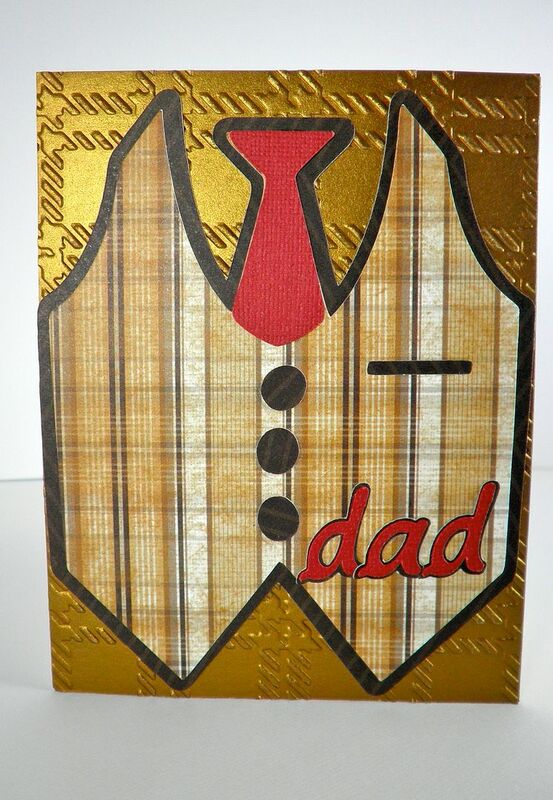 I love your Dad card it's so cool. hugs, Nataliya. Yeah I would love to win a new cart. Oh how I love so many of them! But I really like b is for boy! My favourite card for both you and Melanie is definitely Bloom. Love them all, but those bright flowers have certainly caught my eye! Thanks for the links. I'm going to check out Meow. I don't see anything nativity related though. I think I'm going to have to wait until the NEXT Thursday release. I love those Feelin' Groovy letters! Wow! Too much to take in. Love your projects! I'm torn between a few as to my favorite. I like Handy Man, Savory, and Wildlife the best. Thanks for the chance to win. I can't wait to get my hands on several of these! Love your cards and am excited to see the ones to come. I think my fav lite cart will be the Flourish one. Wow so many to choose from, so right now it is splish splash. Can't wait to see them all. 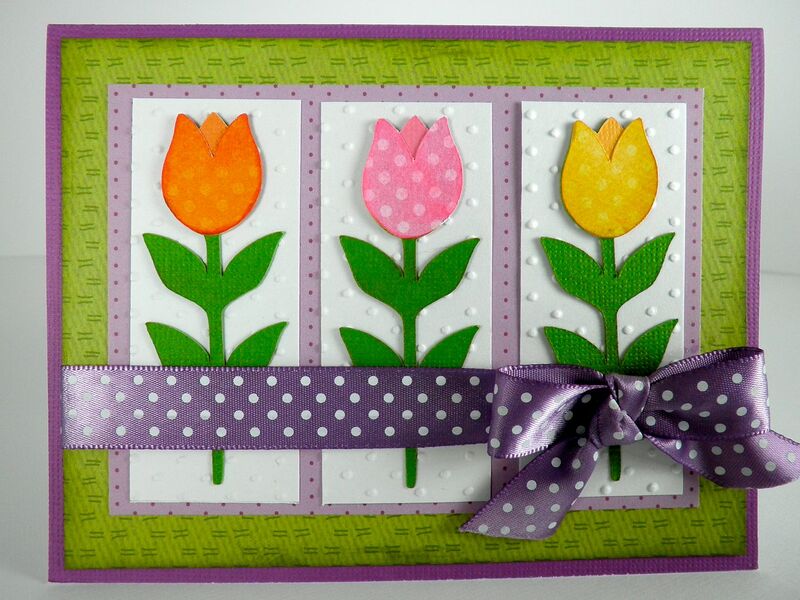 Love the bright colors on the flower card! I think my favorite so far is the Cupcake wrappers.. So cute. But there are so many, I haven't seen them all yet! Right now my favorite is "B is for Boy". Can't wait to get it!! I love all your projects, Joy, but especially the dad card from the Billionaire cartridge. Love the cards! So hard to choose with so many choices but I love the bloom cartridge!